I attended Padua College in Mornington. I heard about The Academy through Alex Rance on the Footy Show in 2016. What Alex was saying about the school got my Mum, Dad and myself very interested and wanting to know more about the school and see what it could provide for my future. The application process was pretty easy as it was all online. I got a call via Skype which was easy because all I needed to do was have the app on my phone to have the interview. At the start, my parents were a little hesitant about the school because it was in Essendon and that would involve a lot of travelling for myself, but it worked out as my Mum got a job that was next to the train line and she started work early in the morning. I wanted to get involved in everything I could get involved in. The first term was amazing and felt like I was at a school where I was enjoying myself and not always arguing with teachers and disinterested in the work I was doing. I wanted to get involved in everything I could get involved in. I was keen to get to know my classmates and Ben, and become close mates. Never would I ever think I would say this, but the work we were doing in the first term was enjoyable and I didn’t mind doing class work. 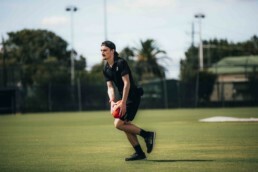 It’s an enjoyable experience getting to hang out with Alex, I’m a big Richmond fan and have followed all the players closely, so getting to hang out with Alex, one of the Richmond players and to get feedback and tips on our skills from a player who is in the best league is a massive privilege. Not many people get that opportunity and I’m very lucky to have that. There’s lots of great things about attending The Academy, my classmates/teachers, gym (Pilates, Aquatics, Gym Program and Spin Class), being able to go for a kick once our work is up to date or we finished our work early for the day, the travel to and from school, environmental things around in my travels and the school. The best thing about attending The Academy is how well every one of us in the class gets along. It’s never silent during class and we’re always getting each other involved in everything we do and it’s the perfect classroom environment. At the end of my studies at The Academy, I would hopefully have made the AFL but if that isn’t to be, then I would hope to have the best kind of qualifications for what I can do out of the school and to make sure I can get into a job involving something in the sporting industry or even go back to the Building Course I finished at my previous school. If I could meet anyone famous, I’d probably love to meet Dwayne Wade who currently plays for the Chicago Bulls in the NBA but played for the Miami Heat for 13 seasons. From as long as I could remember watching the NBA, I would look up to Dwayne. I was shattered when he went to Chicago, but I still look up to him. My biggest supporters would have to be my Mum and Dad. They’ve supported me throughout my previous school when I was a troublemaker and was struggling to keep up academically throughout Year 11. They’re both huge throughout my footy career, during juniors, and they’ve driven me to my training sessions and made sure I’m at my games when required. They’re always down to watch my footy games and always give me good feedback after my games, even if I’ve had a bad game. They always make sure that everything in my life is going well and are just huge supporters in my life. When I’m not playing or training for footy, I’m either playing my other sports that I’m committed to. Whether it’s indoor cricket, basketball or mixed netball (yes netball!). I also hang out with mates. During summer, we stay at each other’s places then head down to the beach or pier and go for a swim. I love hanging out with my mates and love doing my extra sports outside of footy.